Remember The OC? You know, with Marissa Cooper’s self-destructive tendencies and Ryan Atwood’s endless insecurities about growing up in Chino? And who could forget Seth Cohen, the lovable hipster with a passion for comic books and Death Cab for Cutie? A lot has changed for Death Cab since they made an onscreen appearance on The OC, playing a gig at the show’s fictitious club, the Bait Shop, in 2005. Back then, Death Cab was a band who had earned a Seth Cohen-esque fan base by touring endless in a pre-MP3 Blog world. But they were also a band in transition--counting down the days to their major label debut and clearly on the verge of something much bigger. After such a strong release, fans were poised to disdain their first big budget release, “Plans.” But it didn’t happen. It couldn’t happen. The looseness of early records had disappeared, but the songwriting was stronger than ever before and the production was painstakingly perfect. Given all of the effort to make “Plans” a masterpiece, it’s not surprising that 2008’s “Narrow Stairs” headed in the opposite direction. Filled with rock ‘n roll abandon, it was a guitar album, fueled by some of the darkest lyrics Gibbard has ever written. 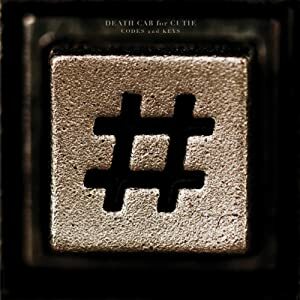 In 2011, things feel a bit more sunny in the Death Cab camp. Gibbard is now a married man and alcohol-free. Their new record, “Codes and Keys,” is the most upbeat in years. Beats skip along wistfully, like a band in love (“You are a Tourist”). At times, it’s all the Gibbard can do to not start dancing (“Some Boys”). Even tracks that are less immediate (“Doors Wide Open,” “Unobstructed Views”) still deliver a rewarding punch. Much like “Transatlanticism,” “Codes and Keys” strikes a beautiful balance between traditional arrangements and studio embellishment; it would not be surprising to hear these songs played on an a piano or an acoustic guitar, but the layers of synths and noise give the tracks an added depth. Somewhere, the writers of The OC are huddled together, trying to figure out how to bring the show back to life, just so Seth Cohen can tell the world how much he likes this record.